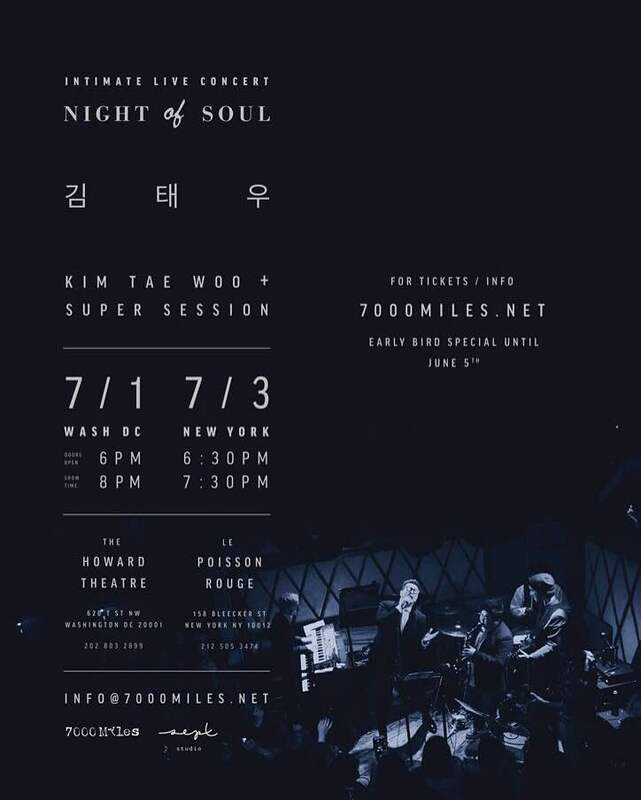 “Night of Soul featuring KIM TAE WOO” is the second intimate live concert series presented by 7000Miles-NYC based concert production company specializing in jazz and intimate Kpop live music series. In 2014, 7000Miles presented KIM TAE WOO’s first solo concert at Rockwood Music Hall (200 capacity) in Lower East Side, NYC. For this show, top artists gathered together to form a one-time-only super session. This is a general admission, standing event. Kim Tae Woo is hailed as one of the most talented male vocalists in Korean and a lead singer of the legendary group g.o.d. Kim Tae Woo is best known for his powerful vocal skills and charming personality. In 2009, he won an award for Male Solo Artist of the Year honor from many Korean Television Associations and Music Awards.